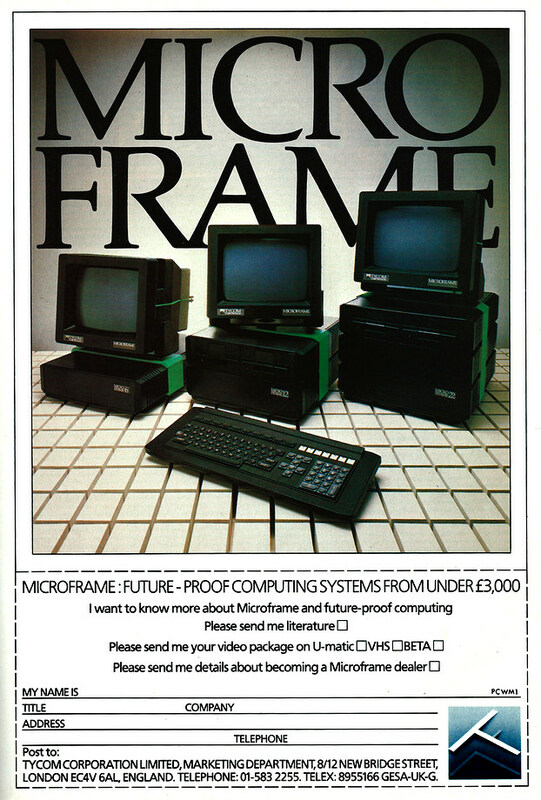 With a futurist "space cargo"-style modular box construction, the "future proof" Microframe seemed to live up to its name. Although not directly billed as an IBM compatible, it did use an Intel 8088 processor and supported both MS-DOS and CP/M-86. It was considered, as many IBM-compatibles were, as superior to the original 5150, with Personal Computer World writing that "IBM didn't get where it is today by being a technology leader, and it isn't about to change the habits of a lifetime just to please journalists". It was designed to be expandable, like Torch's Communicator, but was unusual in that it didn't treat CPUs as being central to the system, but more as peripherals. As such, it was possible to plug in additional processors as well as plugging in compatibile operating systems to go with them on to the "versatile base bus connect" (VBC). Although unusual, it did appear to spawn some immitators, with other systems like Micro Craft's Dimension, announced at the Hannover Computer Fair in April 1984, being able to do the same thing to support not only the IBM PC, but the Apple II, TRS-80 and "virtually any CP/M machine you care to mention". There was some suspicion about the Microframe because it came from the dealer-based company Guestel, which started out selling Apple computers. Apparently, it made "powerful enemies" by undercutting rivals in order to get business going, but as soon as it became big enough it was calling for "an orderly market", much like those before it had done when it was Guestel that was causing ripples. Guestel had been started in 1979 by Alan Timpany, and he was still only in his mid-twenties when the Microframe was launched, through Guestel off-shoot Tycom. Tycom therefore spent a certain amount of effort in getting its business image up to scratch, as it was thought that having such a young MD ruffled the feathers of a lot of the "old guard". This included wheeling in Sir Jack Stewart-Clark as a non-executive chairman. His background was far more traditional, with Bailiol College, Oxford, Harvard Business School, the Coldstream Guards and managerial stints at Pye and Philips Electrical on his CV. Tycom went bust at the beginning of June 1984, with what the receiver described as "a major deficiency of assets", but was rescued by "so far unidentified" business men from the City of London within a week of its crash. Although parts of Tycom's management team - including Timpany - looked to be safe, the future for the Microframe itself was less certain, with Timpany suggesting "the new owners will have to take a long hard look at the viability of the system". However, to the comfort of the 300-400 owners of a Microframe, he added that dealers seemed to remain enthusiastic about the machine, to the extent that they might even take on its manufacture. They looked to have a bit of a task ahead of them though, as 400 units - some of which had been supplied to the Conservative Party - was somewhat short of the 10,000 systems the company hoped to have had installed in its first year. The usual suspects at the time - the arrival of the IBM PC, a hardening of attitudes toward unknown machines amongst buyers, price competition and the impact of other companies failing - were all given as contributory factors to Tycom's demise, however it was also conceded that there were also "internal shortcomings" in the company and that its "standard of presentation and documentation could have been better". Depite that, Timpany believed that "technically and concept-wise, the Microframe is still a superb product" and that the market was moving towards smaller multi-user systems "which is what the Microframe is anyway, so it could be in the right place at the right time". One other option to save the company was also suggested: Tycom could move back to its former parent's hotel systems business, replacing one of Guestel's previous offshoots which had been sold off in 1983.